f you are thinking of getting a display buddy for your desktop computer I am sure you would like to make the most out of the money you have. Well, who doesn’t? What about a multifunctional screen in charge of all the visuals in your room. This video review presents Asus 24T1 LED TV monitor. Why waste space for two when you can use the same one wide screen both as a computer monitor and a TV screen? Why waste space for two when you can use the same one wide screen both as a computer monitor and a TV screen. Pretty practical idea, don’t you think? Let’s see what it has to offer. This multifunctional multimedia desktop buddy comes in 24 inches which make it big enough to enjoy as a TV screen even from longer distance. 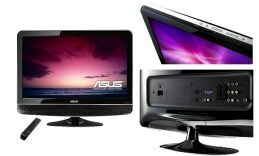 The monitor type is TFT at 1920×1080 pixel resolution. The aspect ratio is 16:9 while the brightness level reaches 300 cd/m2. The viewing angles are a perfect addition to those 24 inches – the maximum horizontal angle is 170 degrees and the vertical reaches 160 degrees. Your visual experience with those 24’’ is additionally enhanced by the matte display surface and for an ultimate comfort you are provided even with a remote control. You can switch between desktop and tv channels with a single press of a button. The front case design is its most distinctive feature, as you can see the speakers are integrated along the bottom border and feature a really effective grid texture. They are not only a facy design feature, but produce pretty good sound too, being 7w powerful. You can connect this hybrid through a D-Sub input and an HDMI port, a video input. It is also HDCP compatible. You can also plug in your headphones thanks to the 3.5mm jack on the right side of the case.